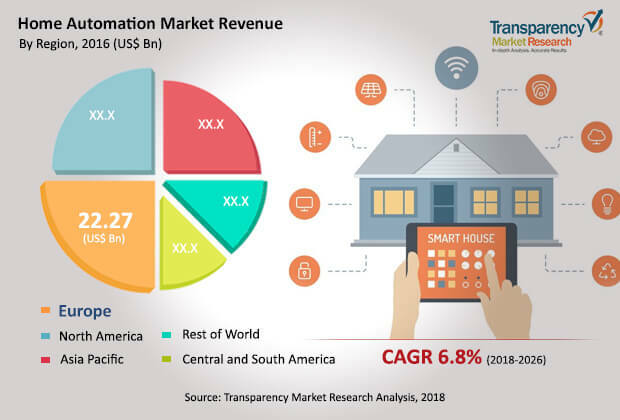 The global home automation market features a highly fragmented vendor landscape, states Transparency Market Research (TMR) in a new publication. Mergers and acquisitions is a key growth strategy adopted by large players in this market. This is serving to consolidate the business landscape, thus increasing the market share of large players. Instead, there are certain restraints that might contain the global home automation market from growing to its full potential. In developed countries, some home automation products have reached the stage of maturity because of which their demand may decrease in coming years. In developing regions due to lack of compatible infrastructure, the use of home automation gets restricted in certain areas. However, urbanization and developing favorable environment will help in rising demand for home automation systems in coming years.